Although there is a wide history of experimentation with meditation and drugs that in Western society are illicit such as mescaline and L.S.D, it is doubtable that hallucinogenic drugs have a positive effect on the experience of meditation. The use of such substances implies in itself a desire to reach an otherworldly state that is at odds with the down to earth and relaxed frame of mind that meditation aims to foster. In light of this, many people are keen to know whether it is suitable to meditate under prescribed Western medicines, particularly those that have a mind altering effect. As meditation aims to foster awareness of ones ’self’ in their natural state, it certainly may be difficult to meditate under the influence of drugs that makes one tired, or alters their mental state in other ways. Strong painkillers, for example, may cause one to feel drowsy, ‘drifty’, and even slightly delirious. Meditating in such a state will not have the benefits that it may otherwise. However, if you are constantly in need of strong painkillers it is beyond doubt that meditation may further help to reduce pain. Cancer patients, for example, are often advised to undertake meditation in conjunction with painkillers. For many people, it will be less a question of whether their medication may be detrimental to their ability to fully appreciate meditation (or vice-versa), but rather a question of whether their particular ailment is best suited for meditation. If you are at all concerned about this it is worth consulting your Doctor. For many ailments precautions can be taken. In the case, for example, that you have severe back pains, a mere altering of your position during meditation may help. You could even elect to undertake a specific form of relaxation to help alleviate that pain (such as Pilates or Yoga). As with many forms of medication, there is a medication versus meditation debate in relation to the treatment of mental illness. Whilst meditation may be considered inadvisable for persons suffering from paranoid delusions relating directly to spiritual issues, many people feel that meditation is a superior way of dealing with anxiety and depression than taking drugs that arguably suppress useful emotions and insights. Whilst this debate continues, it really is a matter of personal choice as to how one chooses to cope with mild depression or anxiety and it is worth considering the joint use of both medication and meditation, so long as this is not likely to hamper your development and ability to cope with your condition. The debate between practitioners of Western medicine and meditation arises largely from a mutual suspicion between these schools of thought. Western science often derides spirituality as based on false foundations and therefore believes it to be misleading to a point where it may actually impede the development of both individuals and society. Conversely, spiritual systems often consider Western science to be lacking in its failure to address metaphysical questions that are fundamental to the experience of human life. This can lead to a position where practitioners of either system miss out on the benefits offered by the other. A derisive attitude towards meditation, for example, often leads to individuals seeking refuge in practices far more harmful than meditation, such as the consumption of alcohol or illicit drugs, in order to distract themselves from their problems. Similarly, useful Western medication may be overlooked by spiritual practitioners, some of whom even prohibit life saving procedures, such as blood transfusions and organ transplants. Possibly the best approach to health is one that is pragmatic and does not rely too heavily on the use of drugs or spiritual practices, but rather assesses their worth in relation individual situations. Meditation itself need not be a rigid practice and an open minded viewpoint in relation to the debate between medication and meditation is possibly the most conducive to a positive experience of meditation. Can Meditation Help Me Quit Smoking? 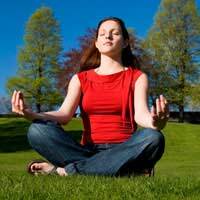 Can Meditation Help Relieve Asthma?